In any competition, fan support is very important. 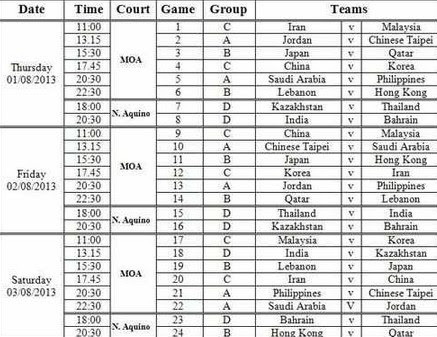 That's the reason why I would like to inform all of you guys that the schedule of the FIBA Asia Championship 2013 is already out. You might want to check it out so that if you have time to watch our National Team, you'll be guided accordingly. The Philippine Team a.k.a. Gilas is is in Group A with Chinese Taipei, Saudi Arabia, and Jordan. Group B will have Japan, Qatar, Lebanon, and Hong Kong. Group C is made up of China, Iran, Korea, and Malaysia. And finally, Group D comprises Thailand, India, Kazakhstan, and Bahrain. Since we're the host, we got the rare privilege to choose the group that we want to be part of and it was Group A. Group A is relatively a lighter group compared to Group C where the heavy-weights i.e. China, Iran, and Korea are situated. The venues of this year's FIBA Asia Championship will be in SM Mall of Asia Arena and in Ninoy Aquino Gym. Both of which are located somewhere in Pasay City.